Our Umbra Valley offers a land with gentle slopes amid olive trees and vineyards, with monasteries and abbeys, castles and medieval hamlets, with a wealth of traditions and simple, ancient but hearty flavors, and that combines traditional Umbrian hospitality with modern offerings for an unforgettable vacation. During your stay at Borgo del Rio you can choose to personalize your vacation in addition to enjoying complete relaxation, cultivating your passions and kindling your desires with a variety of fun and enjoyable itineraries. At the Borgo del Rio Agritourism farm you will find: a garden for the exclusive use of our guests, with chairs; tables and deck chairs a play area for kids; a charcoal barbecue; mountain bikes; detailed maps for walks in the surrounding areas along marked paths surrounded by greenery, such as the “Olive Trail” and the “Via Francigena,” which passes just a few hundred meters away from us; a vegetable garden with produce in season all year; a room with a fireplace for meetings, tastings, and dinners, with everyone together; a museum of the family’s antique farm tools and equipment. Besides peaceful walks near the agritourism farm, not far from Borgo del Rio you have the opportunity to do a variety of sports, from rafting to paragliding, mule riding, guided excursions, etc.….. always surrounded by splendid green nature. From our central location in Umbria, in a short time you can visit beautiful art-rich towns such as Spoleto, Assisi, Todi, Perugia, Gubbio, and the Valnerina – in other words, the best that Umbria has to offer, just a few minutes away by car. The discovery of our art, history and cultural treasures will leave you in awe. St. Francis of Assisi, St. Benedict of Norcia, St. Rita of Cascia, and the countless churches, abbeys, monasteries and convents make Umbria a profound and fascinating region for its religious heritage. Umbria is the home of simple but genuine and flavorful foods, and the origins of our cuisine come from the woods and nature. 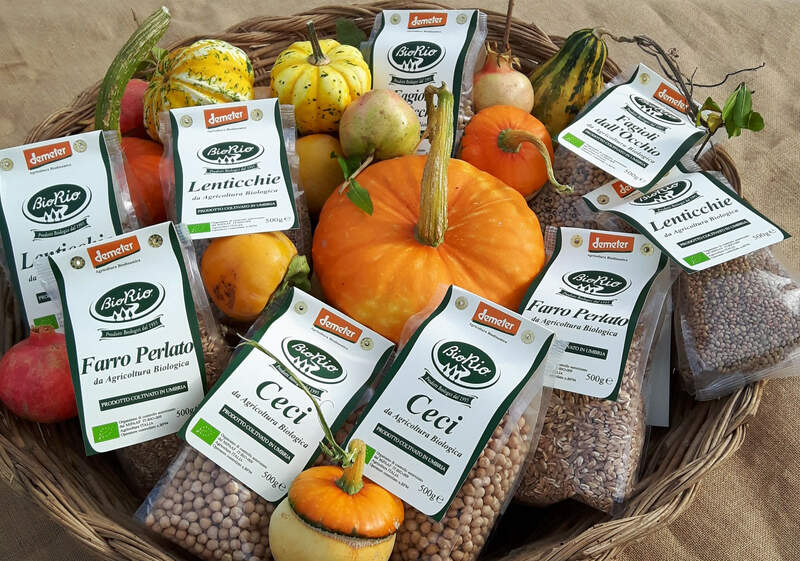 We farm are own land, using organic and biodynamic agriculture methods to grow and produce the spelt, lentils, beans, chickpeas, extra virgin olive oil and other products that you can taste and cook with at Borgo del Rio.